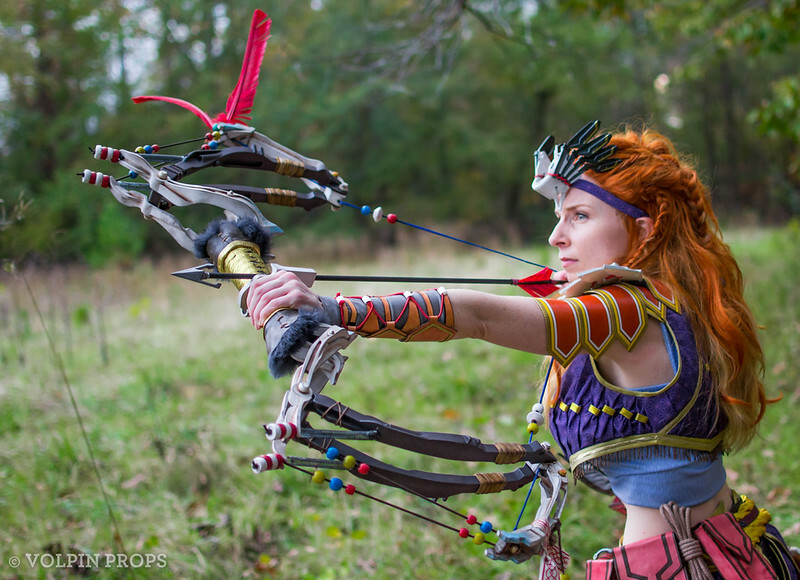 Have you played Horizon: Zero Dawn yet? At the time of this writing the game had just passed its one year anniversary. It is absolutely one of the best games I’ve ever played. Definitely top 3, alongside the original Portal and The Last of Us. 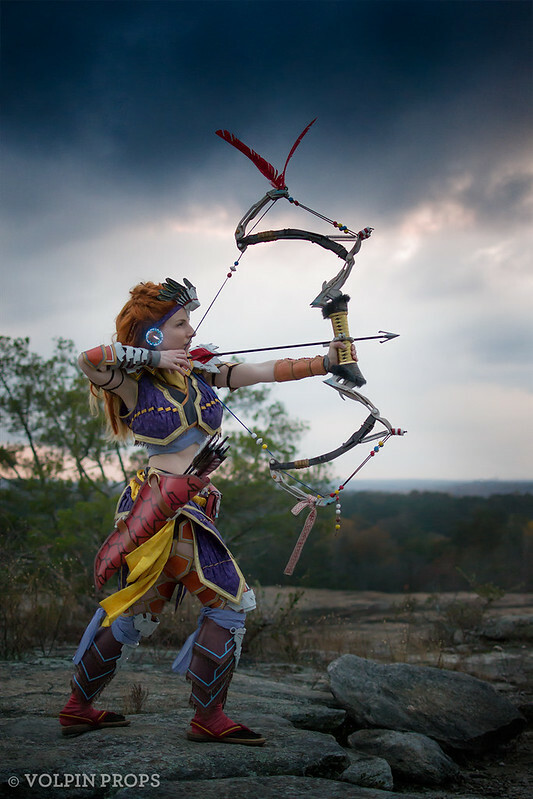 I had to make something from this game: The Shadow Sharpshot bow seemed like an excellent challenge. First, a compare and contrast – the game art and our replica! Horizon takes place in a world of bronze-era human evolution juxtaposed against unprecedented marvels of technology. My paraphrasing will do it no justice, but the implements of the universe carry this theme. Weapons and armor, tools and clothing are all part amazing complex metal implements and rough leather with carved wood. 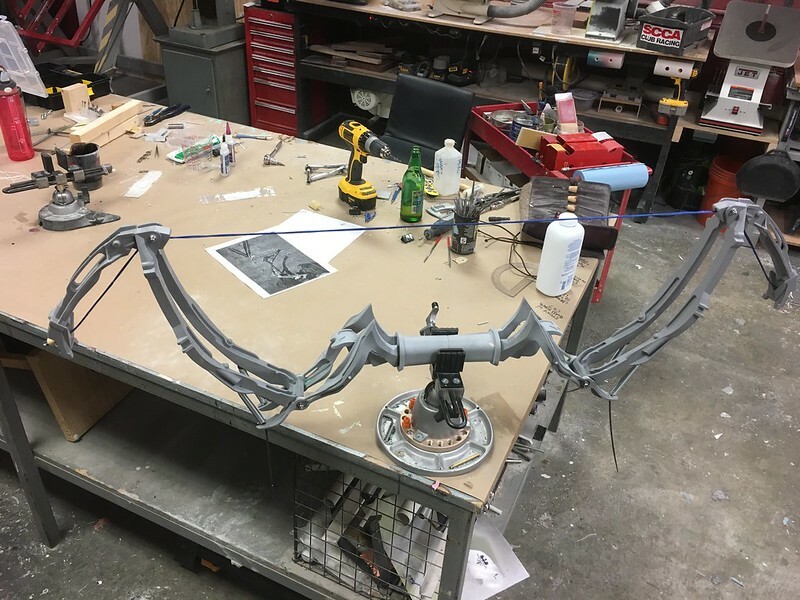 A hand sculpt of the mechanical elements would have sufficed (I’ve scratch built convincing hard surface geometry several times before) but in this world as in Horizon, it’s evolve or die. Time for me to dive into 3D modeling. 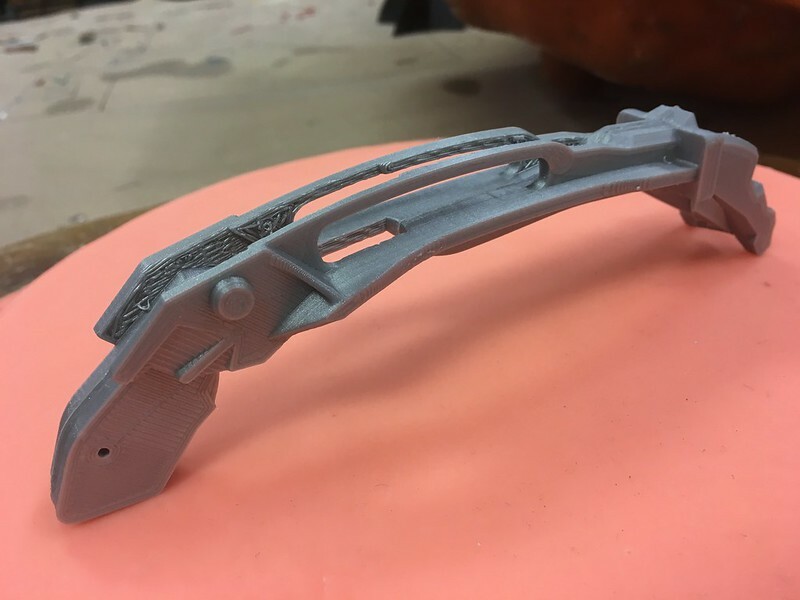 I’ve messed around a little with this before, in exploring some accessories for my long running Mako project, but I’ve yet to tackle an entire prop build as a 3D model. 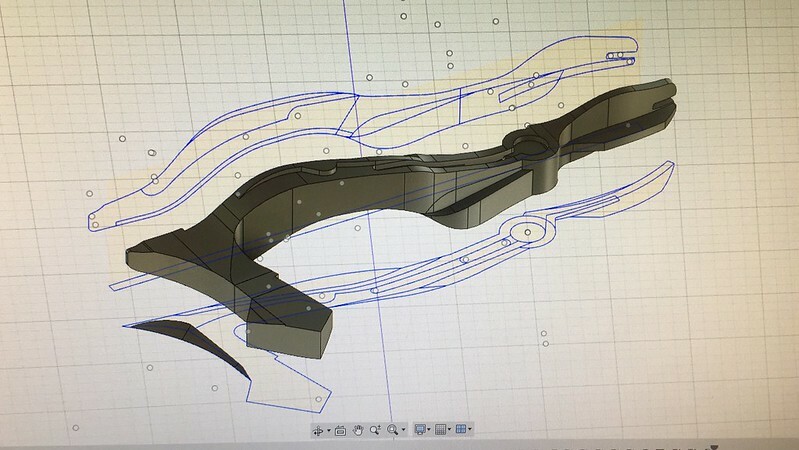 My software chosen for this feat was Autodesk Fusion 360, and my teacher was Lars Christensen – his YouTube tutorials were invaluable and if you’re looking to learn your way around this complex but very capable software, I cannot endorse his videos highly enough. A teeny test print showed me that I was on the right track. My models worked! Parts were output on my Ultimaker 2+ Extended using 3D Universe ABS. I prefer ABS for printing because I have insulated enclosures and ABS is far easier to sand than PLA. 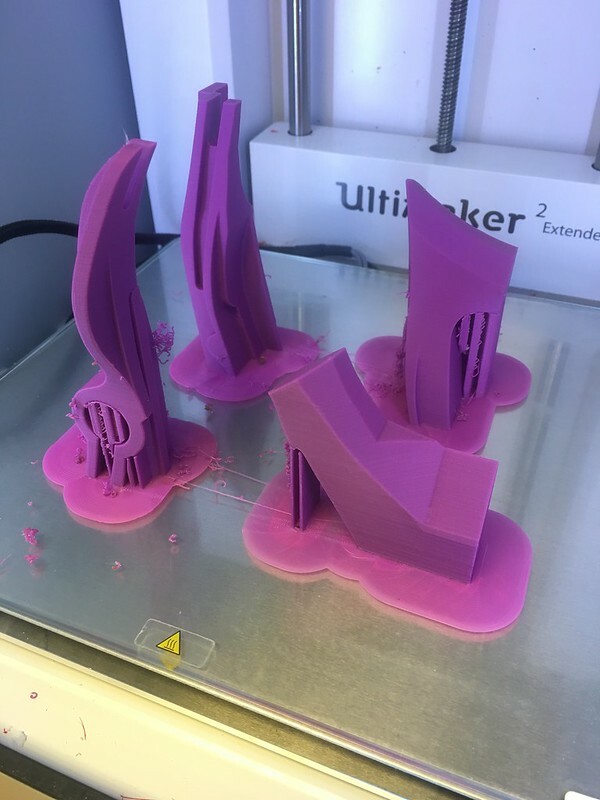 If you’re wondering why I didn’t use the full build height of my printers, I was concerned tall parts would suffer from resolution loss or get knocked over during printing. 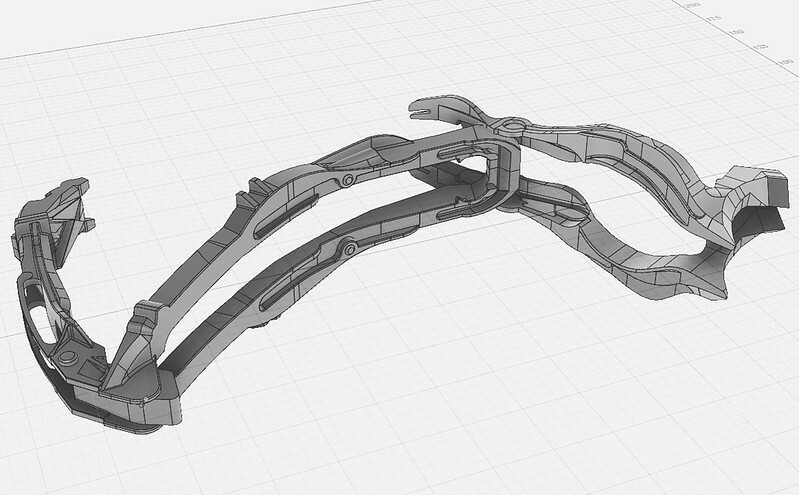 Also, due to the complex shapes, these would require a mountain of support material in order to print in one part. Pieces were joined with superglue and sanded first with 80 grit sandpaper, followed with a 3M fine sanding sponge. 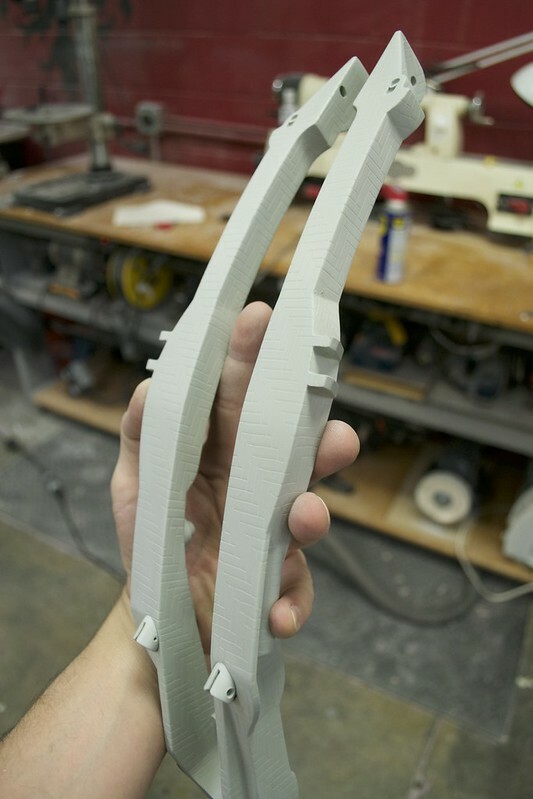 Parts were not reinforced on the interior – everything would get molded and cast to produce the two halves of the bow, and the urethane castings would have metal reinforcement, so I didn’t need the prints to be particularly strong. 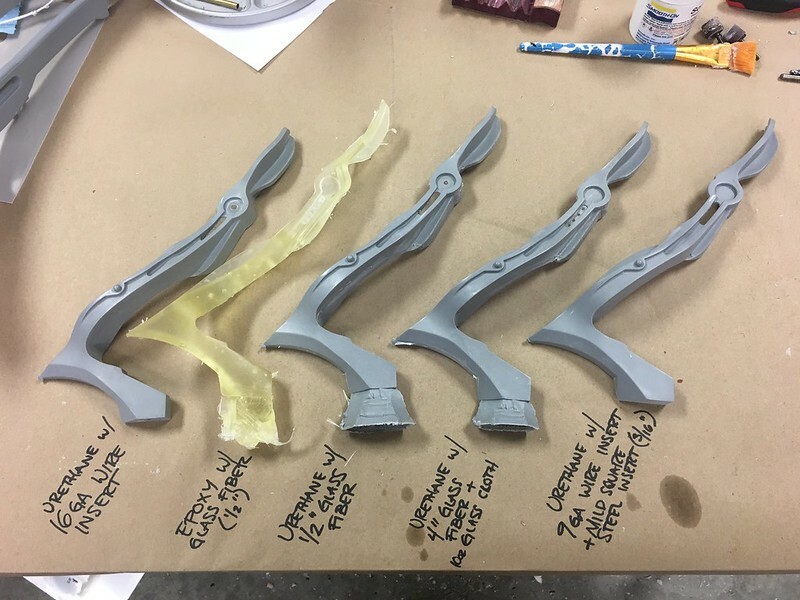 My preferred method of finishing 3D printed parts is to spray them with a high build 2K urethane primer made by Mipa. This paint self levels wonderfully and sands even better. 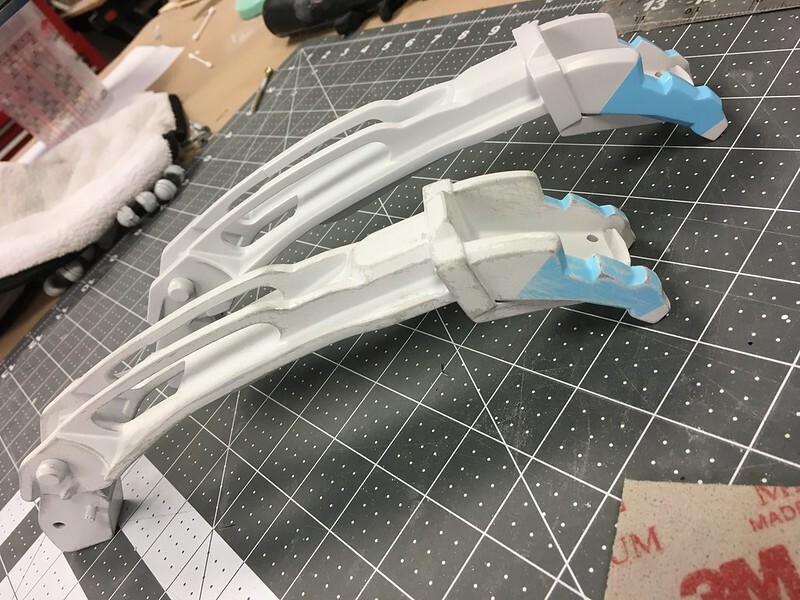 It will fill in a ton of print lines and reduce the time to molding by half or more since you don’t have to do multiple passes of skim filler or putty. I’ve managed to convince nearly every other SFX shop here in Atlanta to start using it, and you should give it a try too! 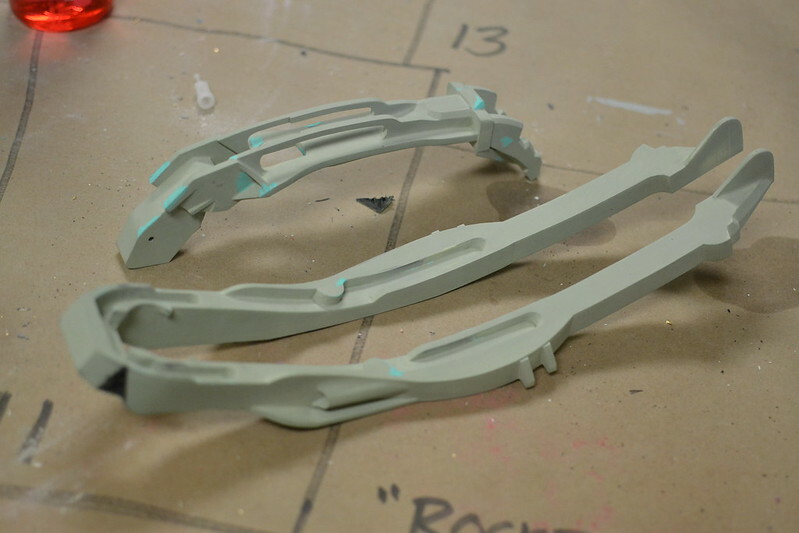 With the pieces sanded and smooth, it was on to moldmaking. 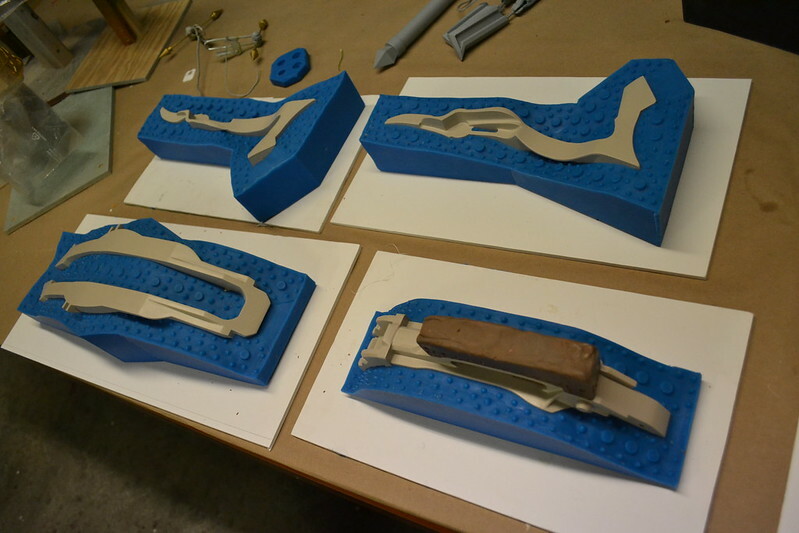 Yes, box pour molds like these are exceedingly wasteful and pricey, but they are fast! 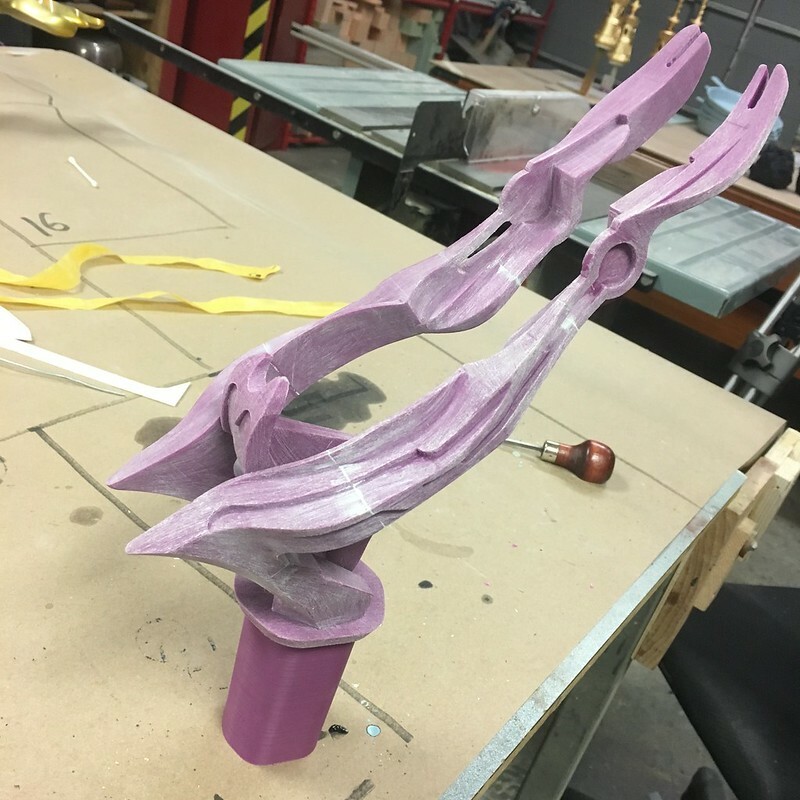 I was trying to get this prop done for DragonCon 2017, and with a full set of Aloy’s armor left to build (more on that later) I had to be quick. Silicone used was Mold Star 30 and I probably went through 3 gallons of the stuff. They all worked though! If you’re making huge box pours like this, it’s important to brace the upper sections of the walls against one another. 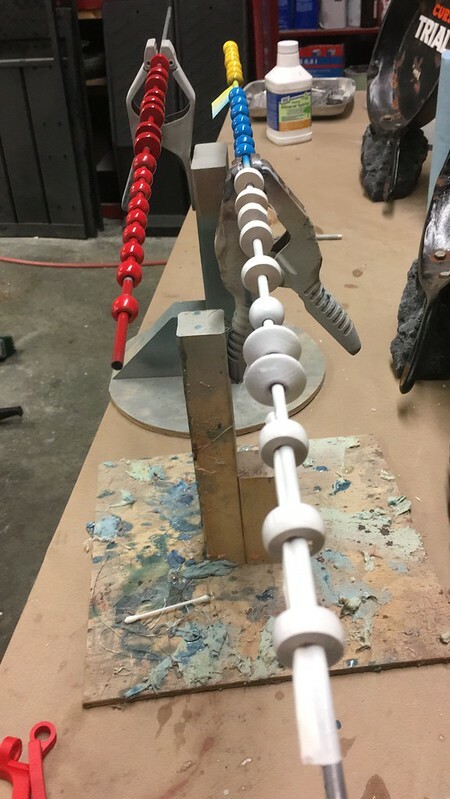 The fluid pressure exerted by several pounds of silicone can warp foamcore and break apart glue joints, and you don’t want all your expensive rubber to pour out all over the floor. Sadly, I speak from experience on this. Brace your boxes! 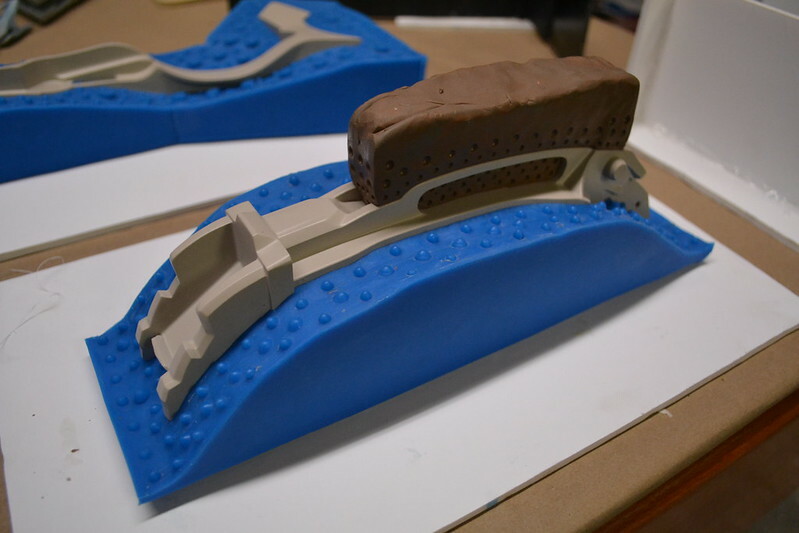 As often as possible I tried to use old mold material to fill in some of the voids when pouring the new material. You can see some of that in the video below. 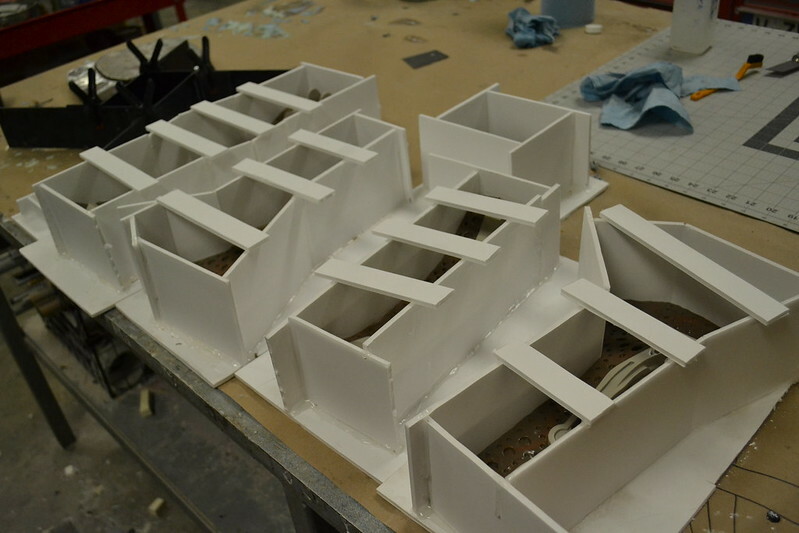 Load bearing parts were also reinforced with steel bars to better help handle the weight and flex of the bow parts. 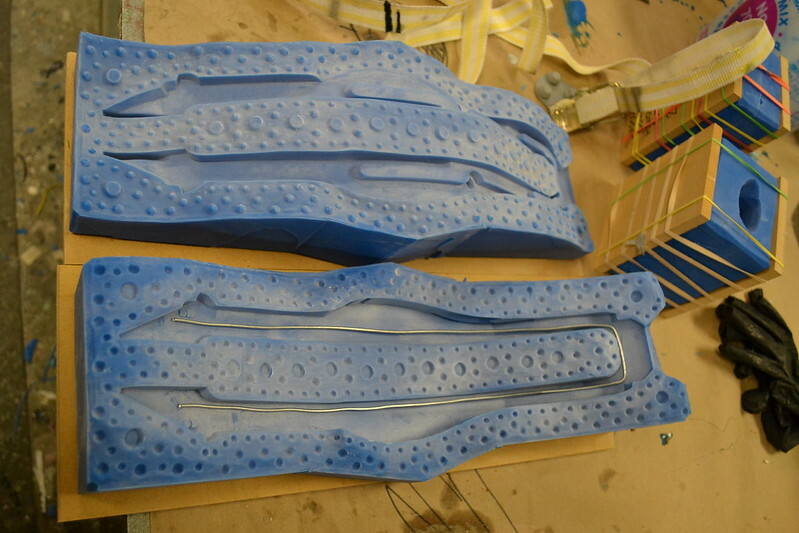 One piece in particular had a few through holes in the surface which necessitated a plug in the mold. 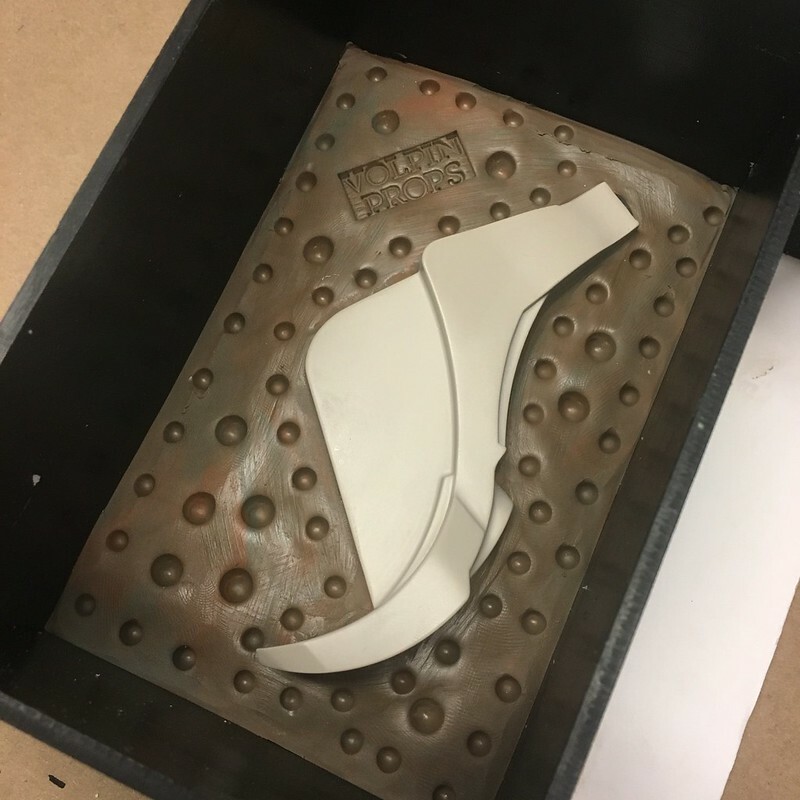 This was done by inserting a large block of clay into the section with the through holes and pouring the second part of the mold with this clay plug in place. After section 2 cured, the clay was removed and a third silicone block was poured into the plug cavity. You can see the demold of this in practice below. I’m pretty proud of this solution! 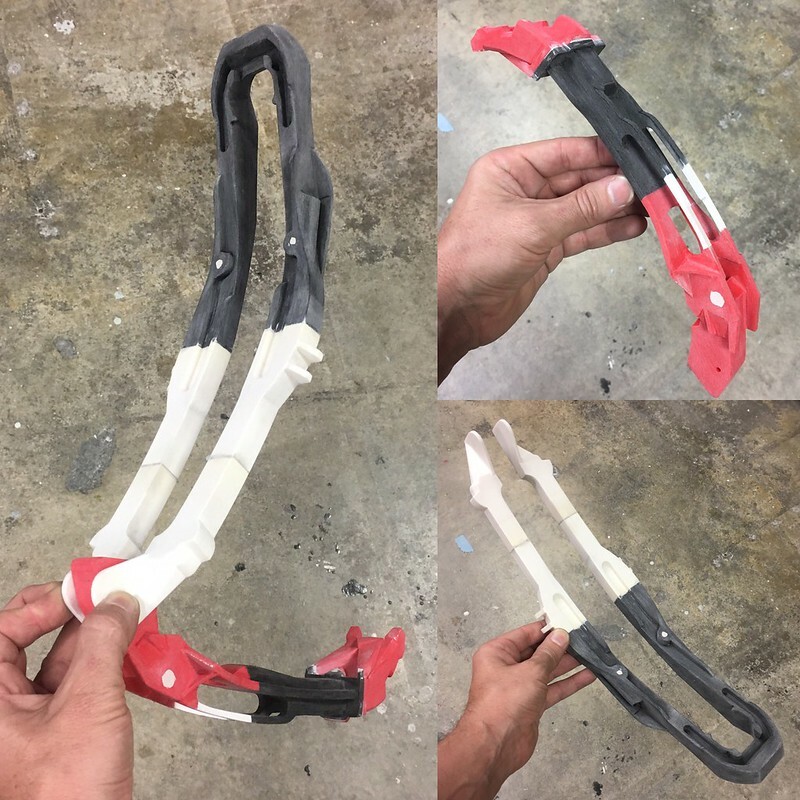 Complex mold on the #horizonzerodawn Shadow Sharpshot bow – three part with a through plug. Really proud of the results! 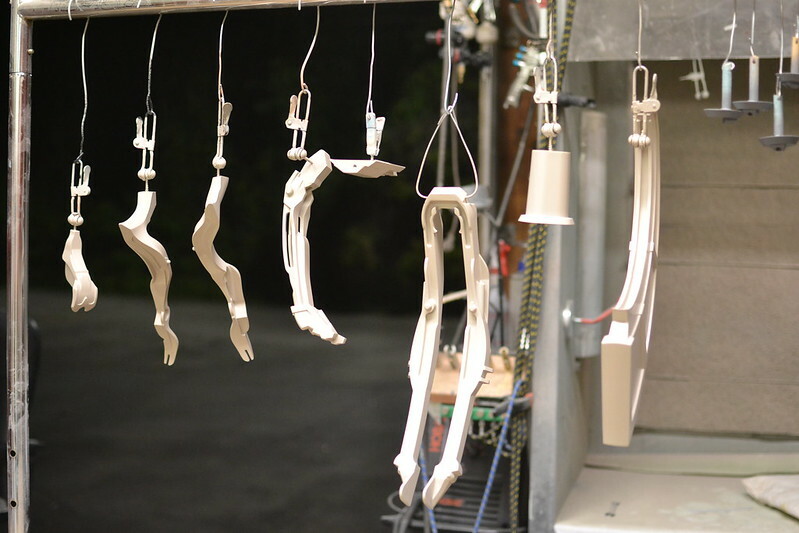 Some testing was done with epoxy resins to see if parts could be cast more lightweight or stronger than steel reinforced urethane, but in the end the old standard plastic (SmoothCast 320) won out for fidelity of casting, ease of cleanup, and rigidity of parts. 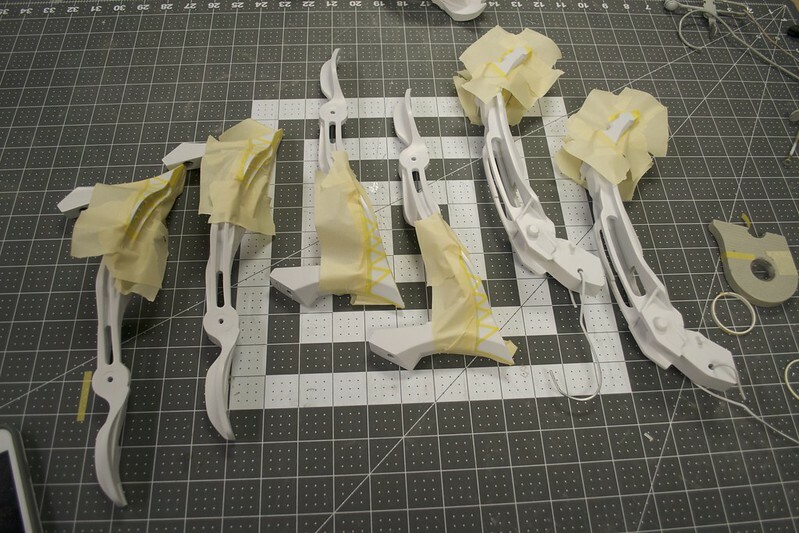 The finished set of pieces for one half of the bow weighed in at just under 2lbs. 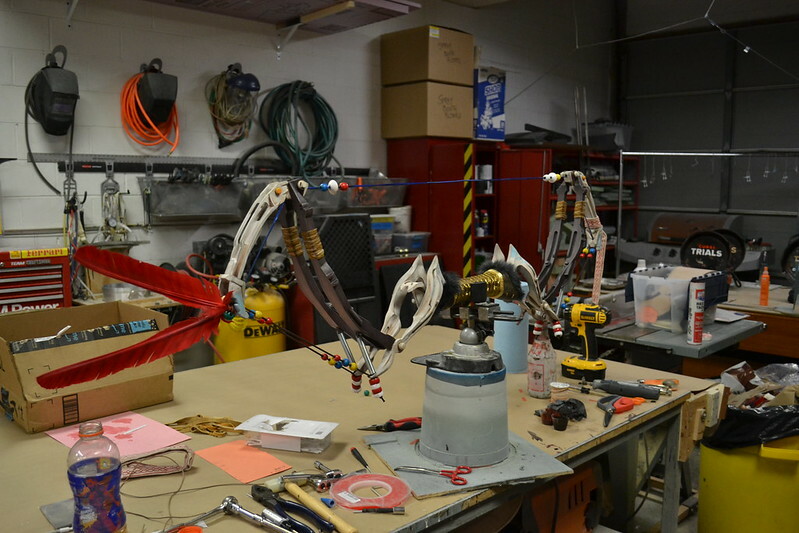 I figured with paint, glue, and other miscellaneous bits the final weight of the bow would be around 4lbs. 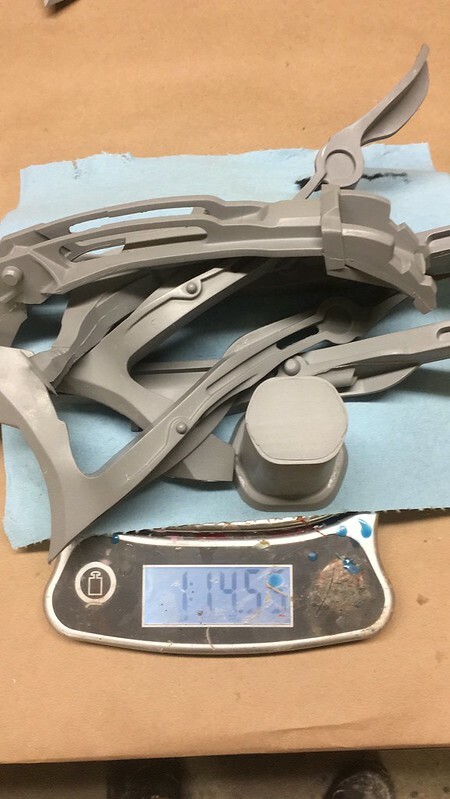 Not bad for a huge cosplay piece! Here’s a shot of the full kit. 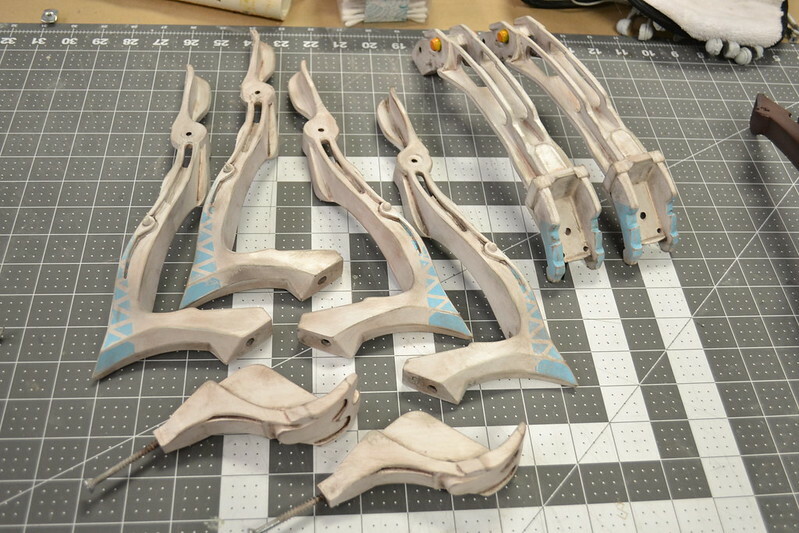 There’s twelve parts in all, but that’s only the main structure of the bow. I had a lot of hardware left to sort out. 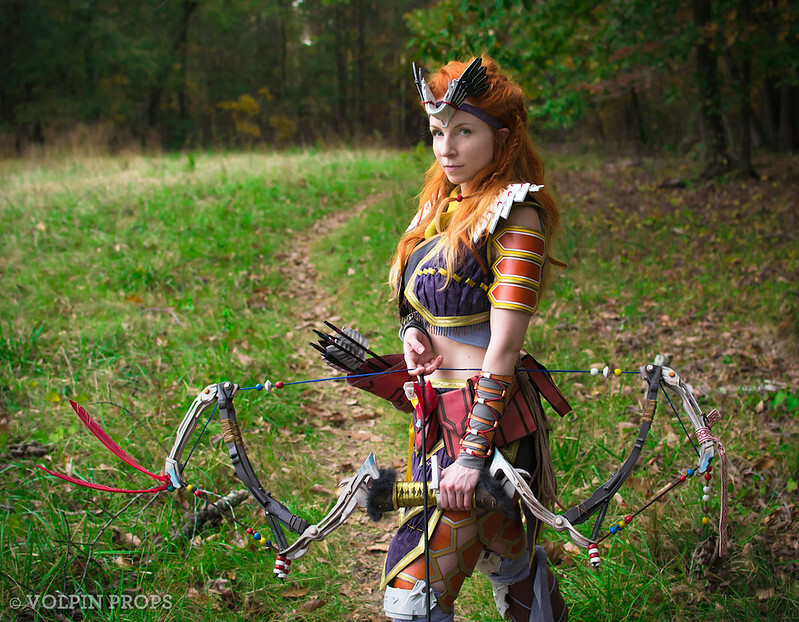 In-game, this bow articulates over several hinged joints to fold inward on itself as the bowstring is drawn. As closely as possible I wanted to emulate that effect for the replica as a bit of extra visual effect. 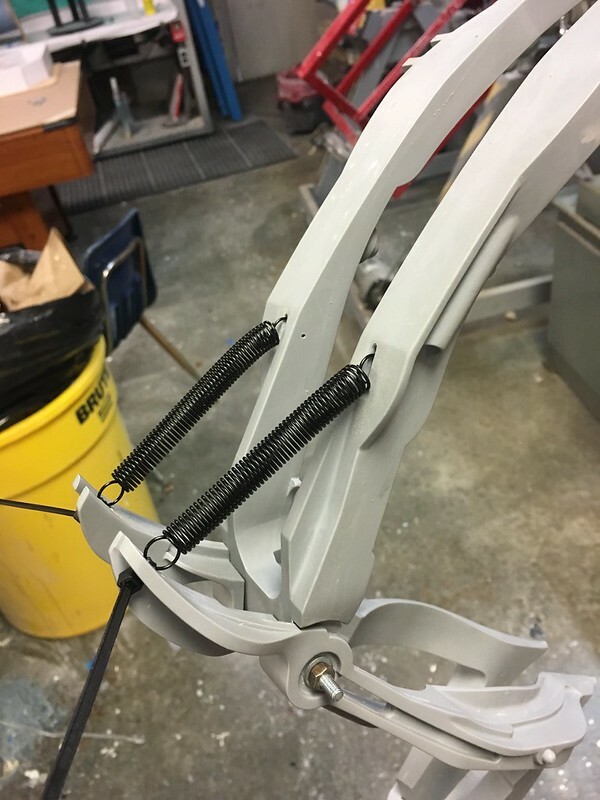 To do this, I employed a set of steel extension springs that would pull the upper two segments of the bow upright against the lower support parts. Sorting out the correct spring rate that would hold these pieces in place without being too tight and damaging the castings proved to be tricky. In the end I went through about 5 different variations of this set-up before it worked the way I wanted it to. 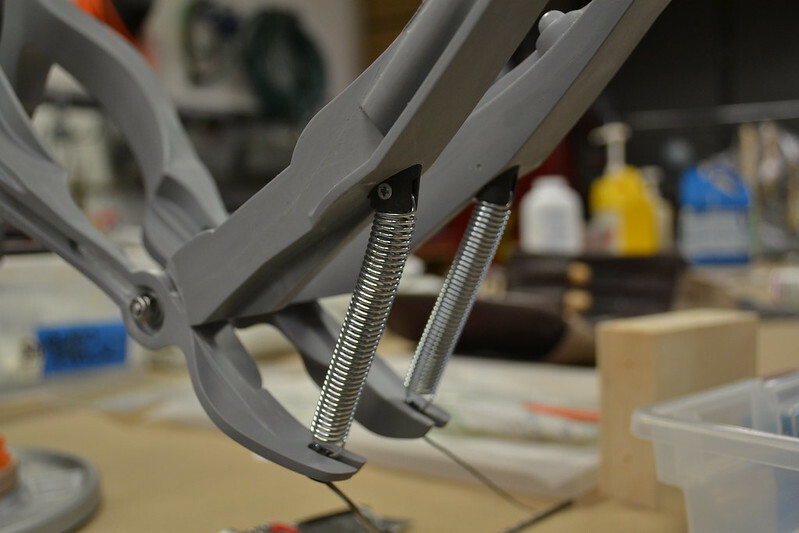 One element I neglected to include in the model was a set of anchors for the base of the springs. For these I cut down a set of urethane rods and slotted the facing edge for the spring to recess into. 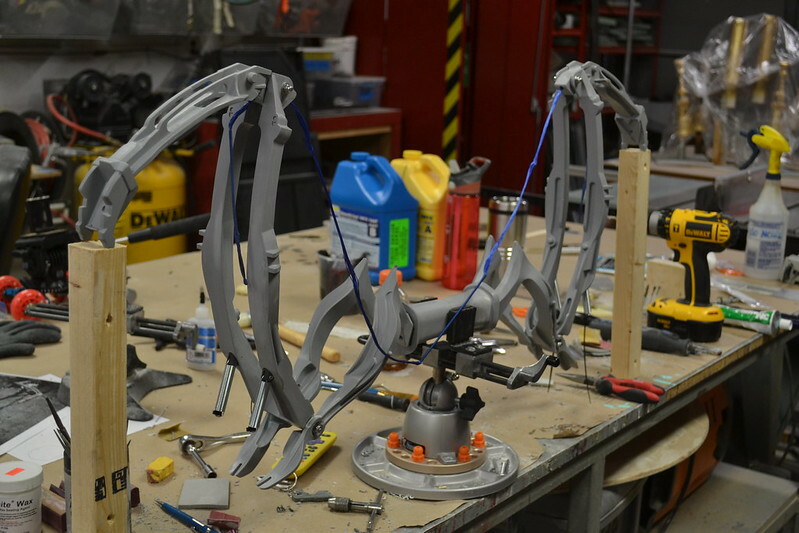 Since the bow has to articulate, the upper sections are held together with a myriad assortment of bolts and screws. 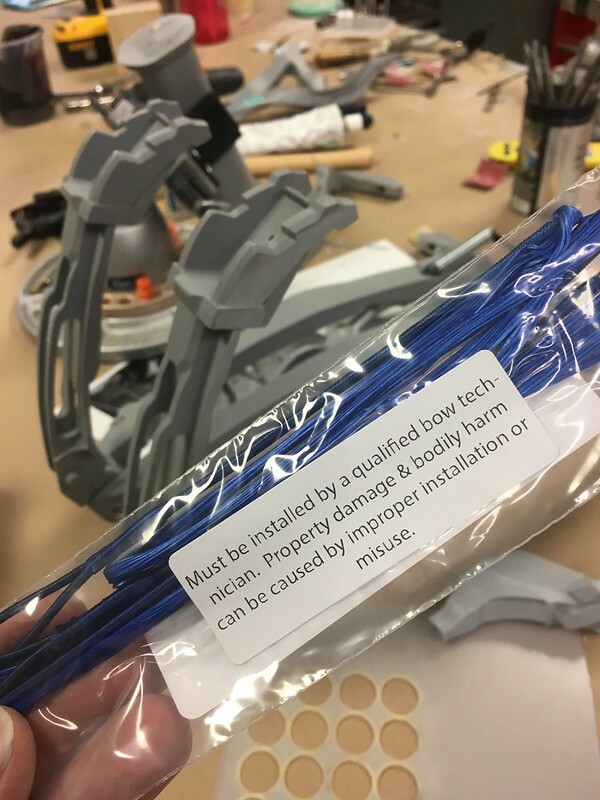 This facilitates functionality, but also allows the bow to be disassembled should anything need repair or maintenance in the future! As this is going to be kinda sorta a real bow, I went and bought a real bow string. Unfortunately I’m not qualified to instal it. Don’t tell anyone. First shot of the parts all together! I was getting giddy at this point. Also, note the thing the bow is sitting on – that’s a Panavise, and you need one! After the last of the rigging was finished it was time for paint. 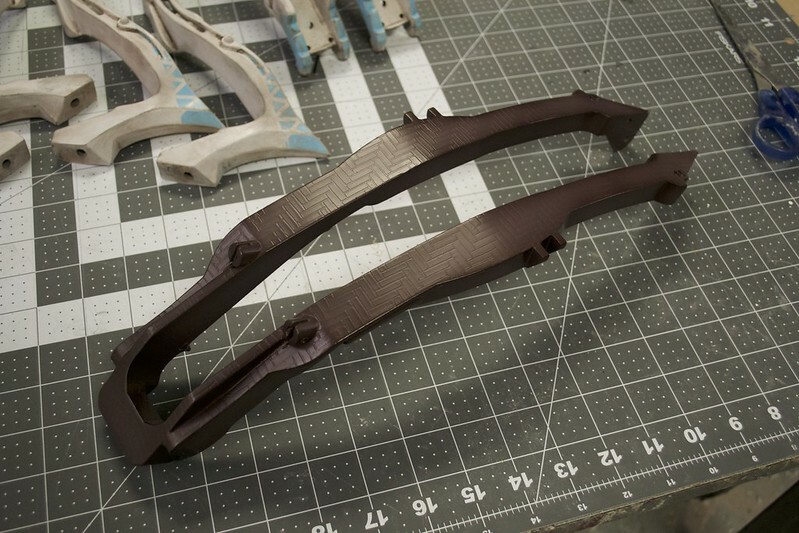 The middle sections of the bow have a dark brown/gray pseudo carbon fiber weave texture, but it’s huge in game. Like, wicker basket huge. 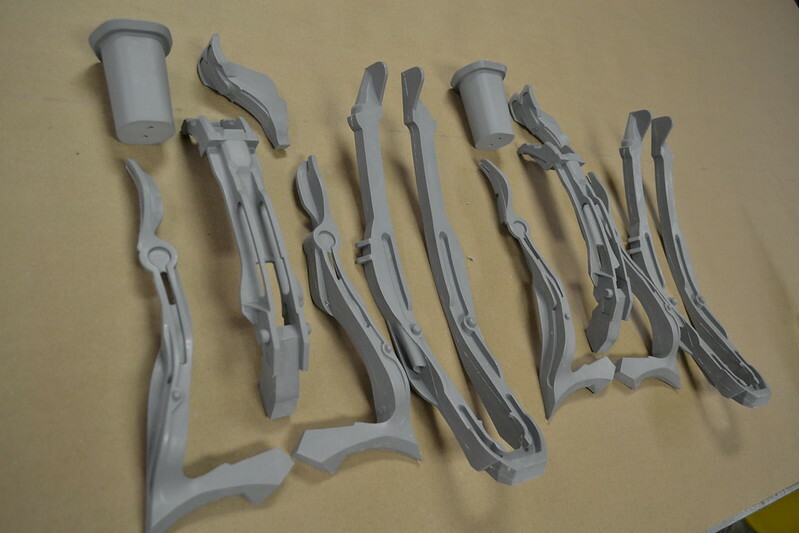 I emulated this by cutting out a vinyl stencil and spraying a thick coat of primer over the parts. 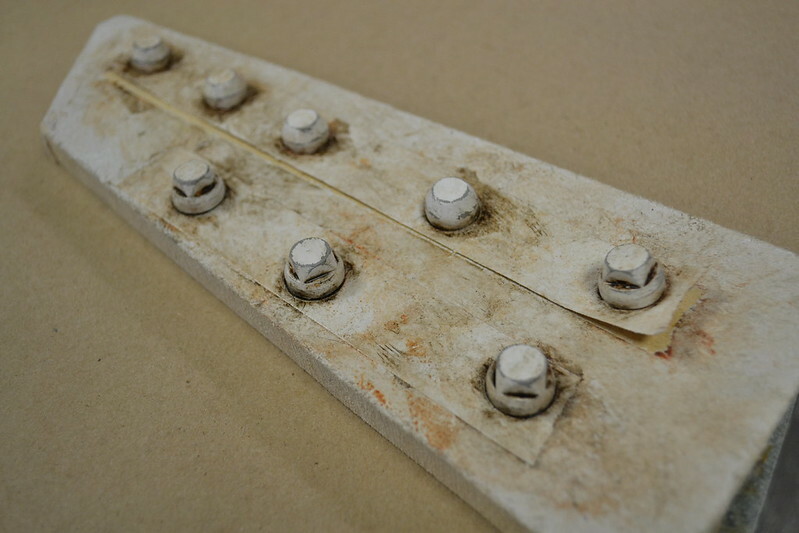 This was removed and the exposed areas were now raised with the added thickness of the paint. 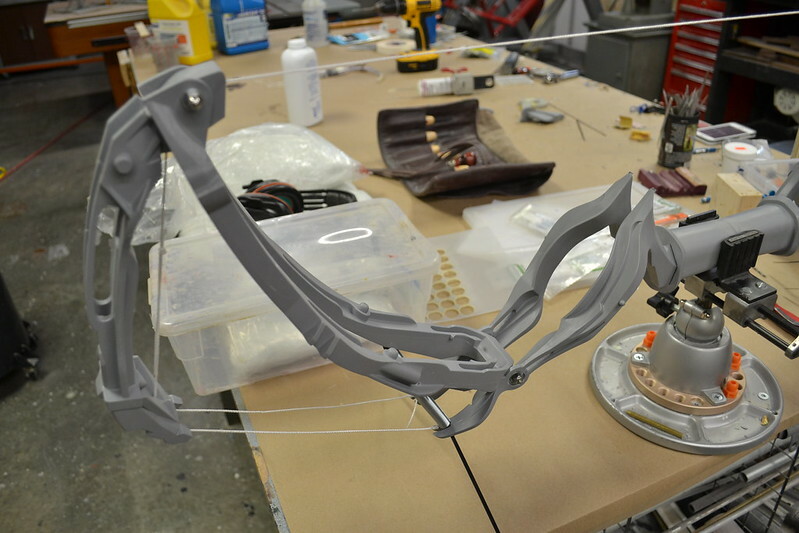 Following primer, parts were painted with Createx Wicked Colors to match the hue of the in-game bow. 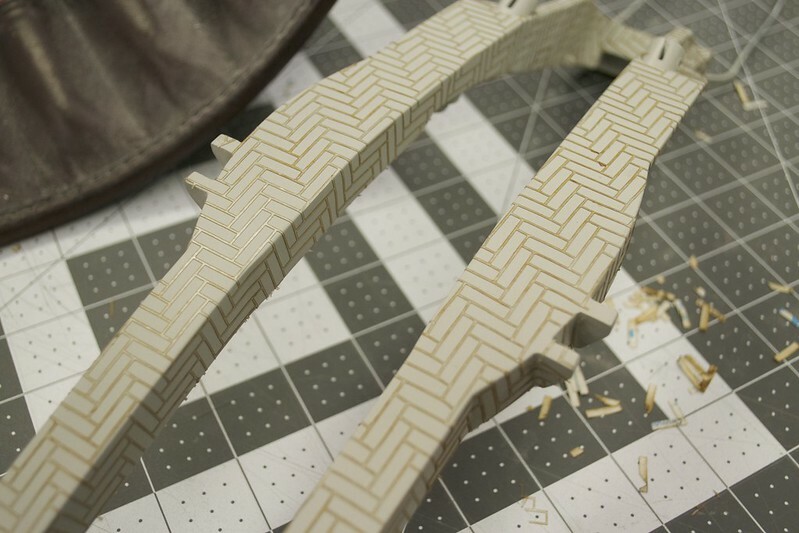 The center segment was a custom brown mix, and the remaining bow parts were painted white, then masked off with Tamiya masking tape for subtle blue accents. 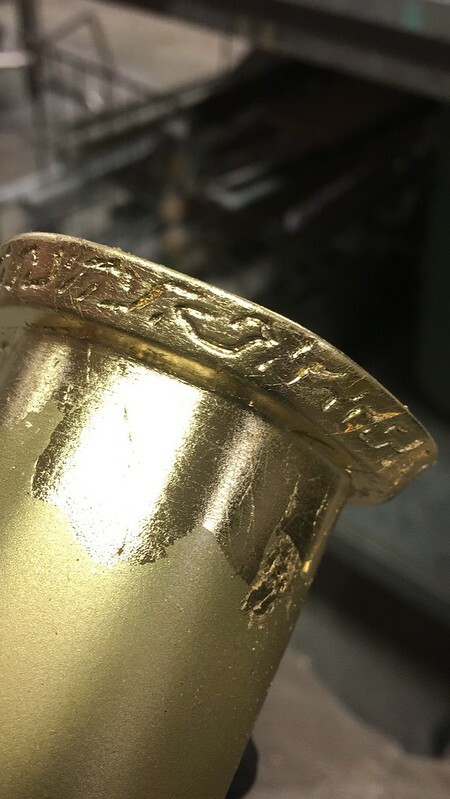 These parts were left to cure overnight, then a series of wire brushes and scrubbing sponges were used to scratch away paint in high areas to create chip marks and wear. 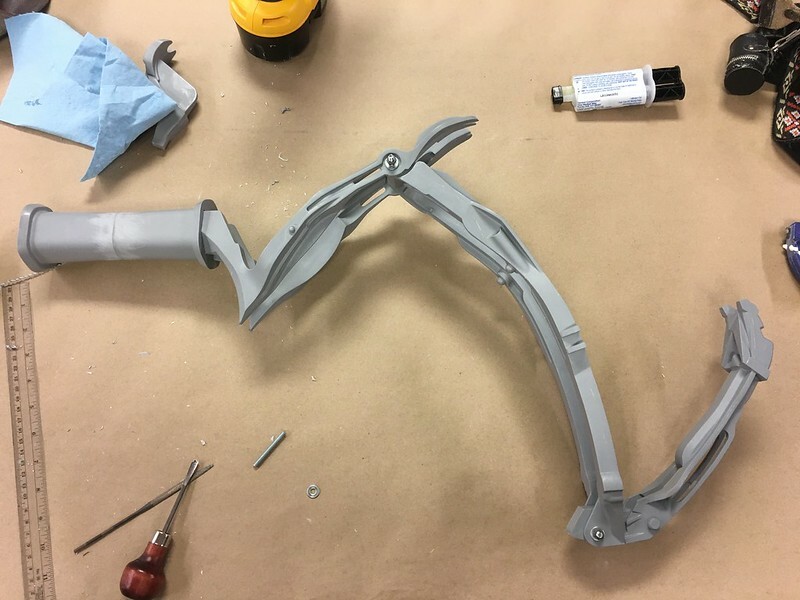 Since the castings are dark gray and the primer is light gray, this gave the chipped areas a lot of contrast against the white paint. Grime and grit was then added in a series of acrylic washes of various brown tones. If you’d like to know more detail about this kind of weathering, check out my eBook about prop painting right here! The handle of the bow is waaaay more opulent than the rest. Gold accents and a gold handle wrap that looks to be Japanese inspired. It should clash with the rest of the design but for some reason it works. 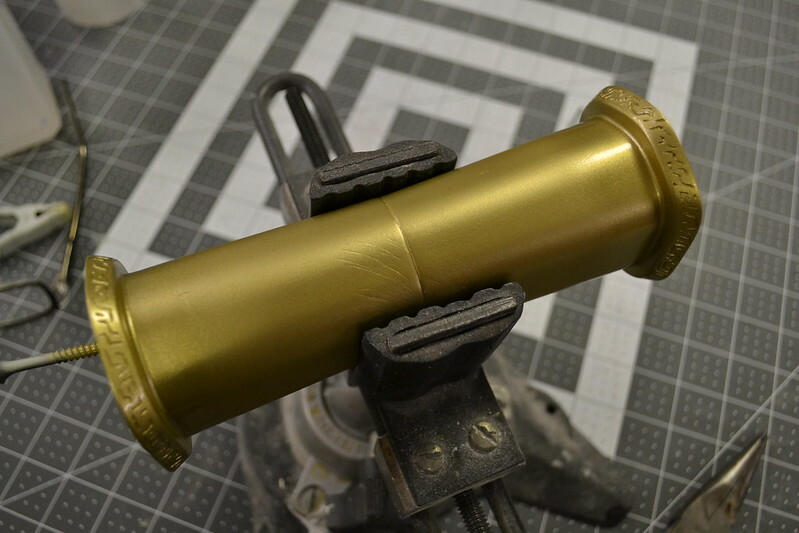 This section was first painted with House of Kolor Solar Gold before being gilded with gold leaf. The wrap is a super opulent ribbon found at a local fabric store, wrapped over goatskin leather. So fancy. The handle ends terminate into segments of leather backed with fur. A fellow builder Cavegeek sent me a few strips of rabbit fur to use here, and the leather segments are eva foam cores wrapped in more goatskin. The handle was now complete! Seemingly endless bric-a-brac is strewn all over this bow. 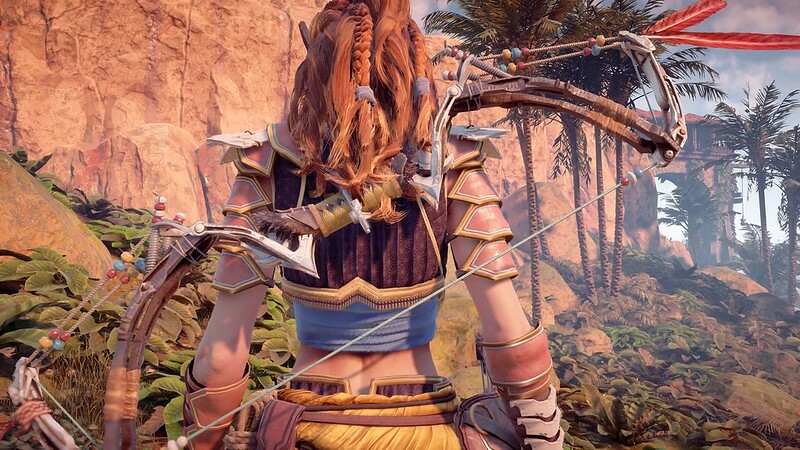 A common joke during this project was that Aloy is a 16 year old girl and she’s just treating her sniper bow like any 16 year old would bedazzle a phone case. There’s nearly 50 beads of various colors, leather wraps, feathers, and a long strand of fancy fabric dangling from the bottom. 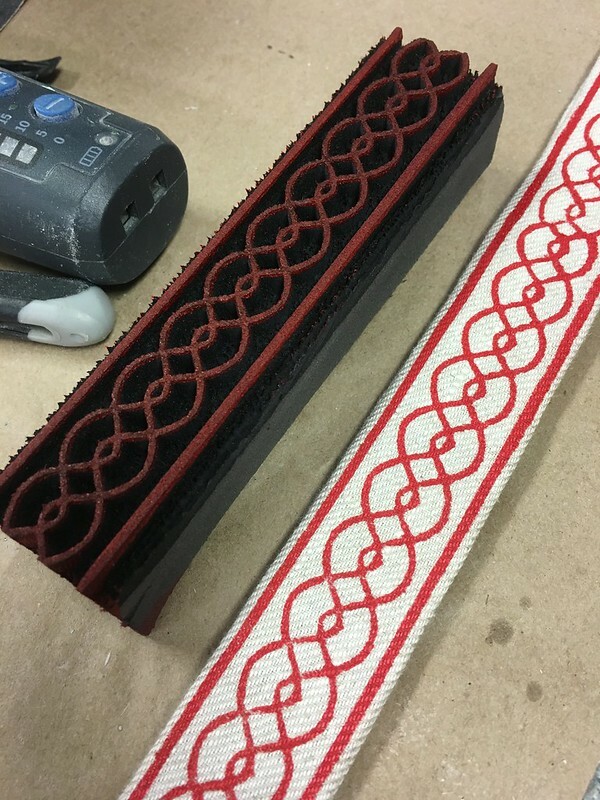 Beads were set on a long steel rod to be painted the correct colors (I used cheap Krylon rattle can enamel for this) and the ribbon was created by laser etching a repeating stamp out of EVA foam and using it to create a pattern along a length of linen. 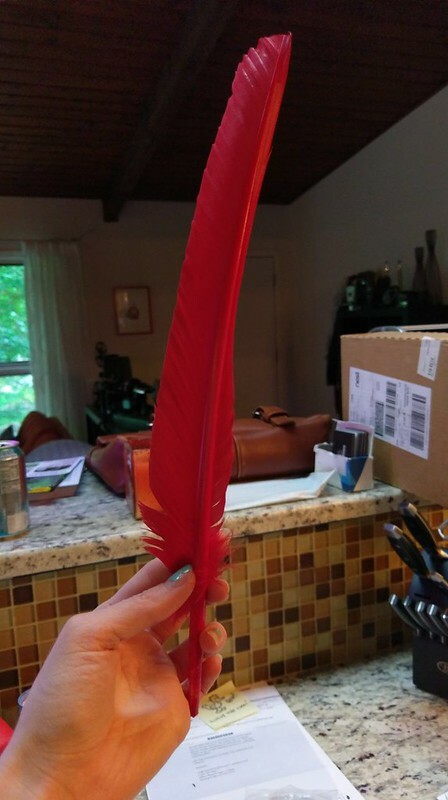 Feathers were the last bit to be sorted – large goose feathers were dyed red and insert into two slots on the top of the bow. Nothing quite says “sniper” like two giant hey-look-over-here red feathers! Time for assembly! 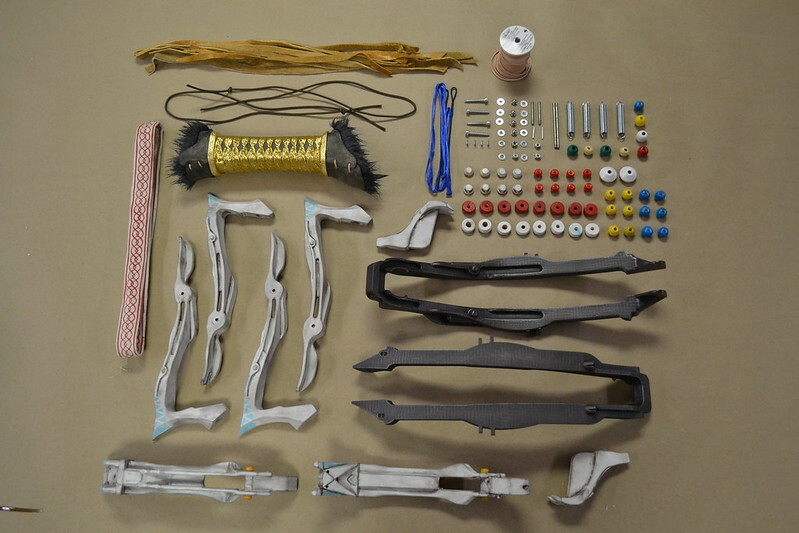 This knolling of parts shows just how much goes into this prop. It was an engineering puzzle for sure, but one I’m glad I tackled. 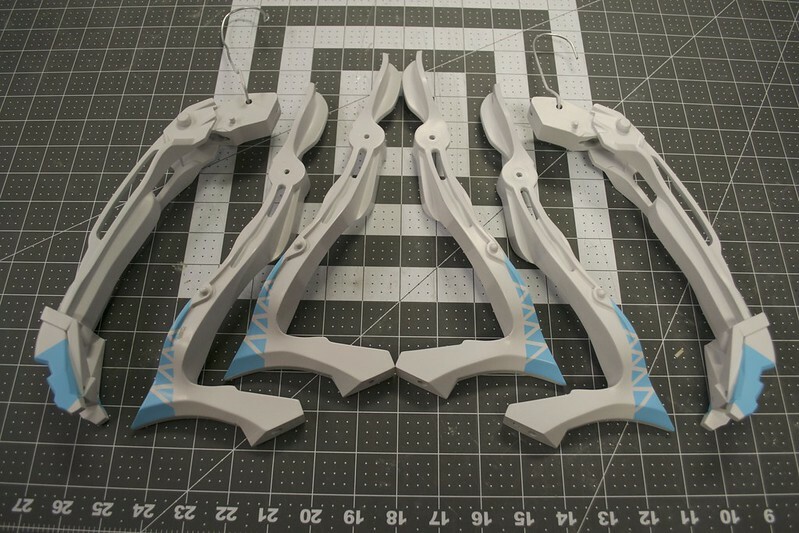 The assembly process went rather quickly and smooth, since I’d done many dry-fit assemblies prior to the final. It still takes a few hours but here’s the final piece! 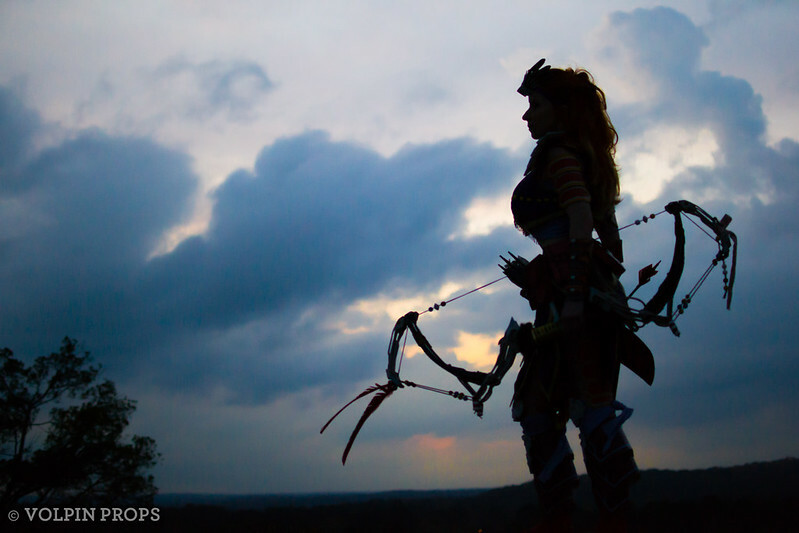 We’ve taken the bow out alongside Emily’s Aloy (Carja Blazon Heavy set) for one shoot but we’re looking to do another soon. Until then, enjoy these shots and be sure to check out my Flickr for more behind-the-scenes photos of the bow project. Also, follow Emily over on her Instagram to see what she’s making! As always, thanks for reading and happy building.